Severe tooth, jaw or facial muscle pain may be from the effects of grinding or clenching your teeth. A custom-made night guard is an effective solution by preventing the wearing down of your teeth, and alleviating the pain and muscle soreness accompanying these bite habits. 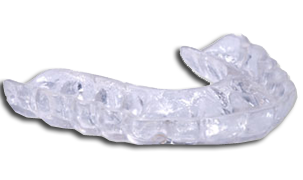 A night guard is a thin removable device that is worn over your lower or upper teeth as you sleep. Studies suggest those who grind and clench their teeth may experience up to 80 times the normal tooth wear per day compared to those who do not. A night guard appliance can offset the effects of this often-subconscious habit while protecting your teeth and preventing the pain and discomfort of clenching, grinding and other TMJ related problems. Sometimes jaw excercises, thermal packs, bite adjustments, and other treatments are required. Call our office to properly diagnose and obtain relief for your bite habit and pain.